When you next find yourself putting on a spur of the moment cuppa for friends or taking a plate of food to share at someone else's house and you have all of five minutes to spare, these will definitely do the trick! But if you are never found with a packet of choccy bikkies in the house, then this might not be the recipe for you. This recipe takes a packet of Tim Tams into a whole other dimension. Chit Chats work just as well too. Who'd have known you can pass yourself as a home baker with just a store bought packet of biscuits! Take 1 or more packets of Tim Tams (any flavour works, but Double Choc are our favourite). Throw em in the whizz or blender till most bits are like biscuit dust with a few chunkier bits remaining. Mix in 2 tablespoons of sweetened condensed milk for each packet of Tim Tams you've used. Mix together till the condensed milk has bound the biscuit crumbs back together. 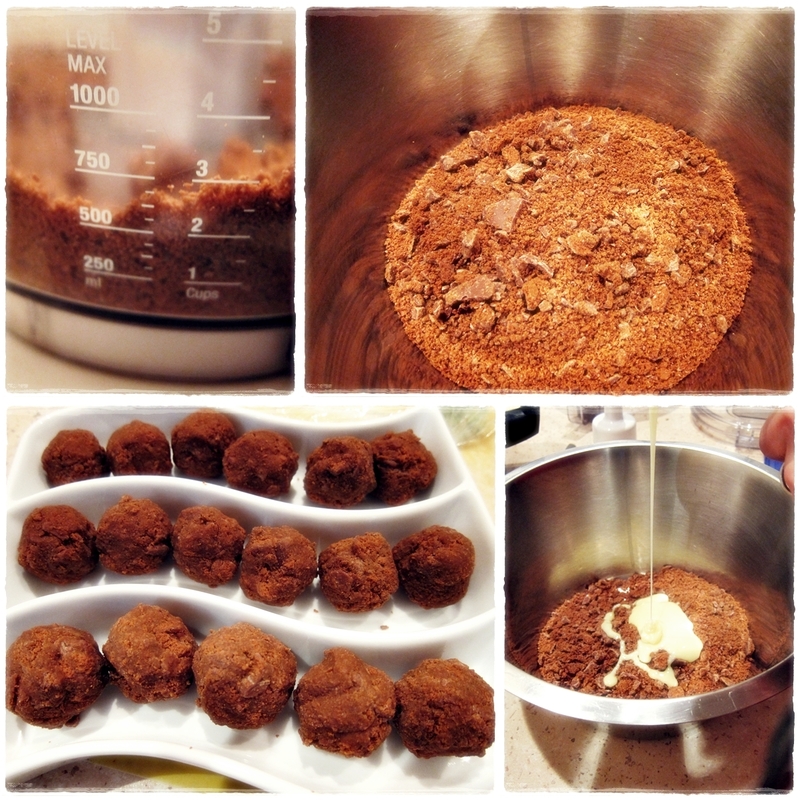 Form small balls with the mixture. One packet will make about 16-18 balls. Chill in the fridge until you want to eat them. To make them naughtier, melt some chocolate and drizzle over for a crunchy chocolate topping on each ball. Be warned, they don't last long! Oh my yum!! That is DANGEROUS!!! Oooooooo, you MNM's are naughty, but very nice, people!!! definitely recommend dipping in chocolate. The white one work a treat too, dipped in chocolate. So good! Mmmmm - they look soooo good!! Yum, I haven't made these in ages! I used to make a plain choc batch and a batch using the mint tim tams. The mint ones were very strong though!